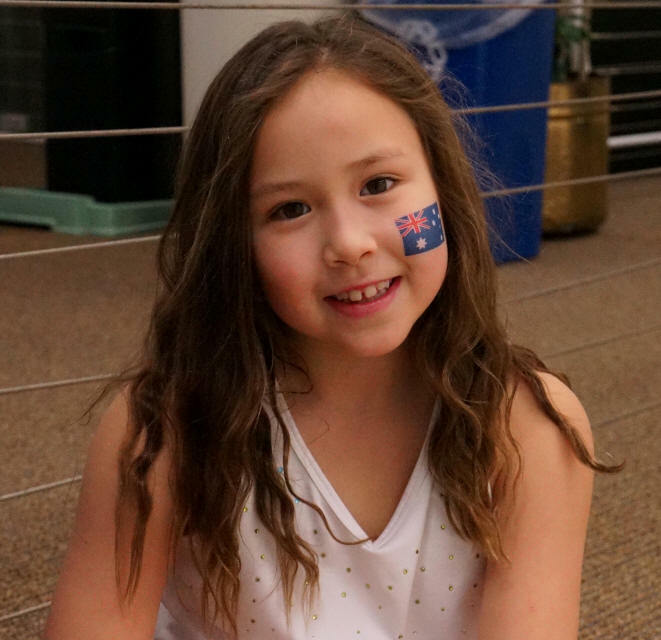 The final of the Cleveland Classic was between the top two ranked players in the world, and the packed crowd at Cleveland Racquets Club were treated to a final that lived up to that billing. 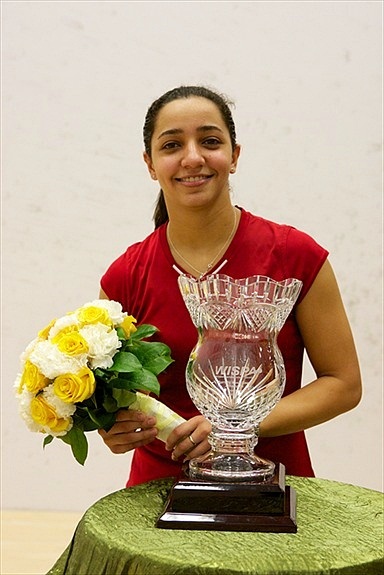 It was a seesaw five-setter that eventually saw Raneem El Weleily come from 1-0 and then 2-1 down to claim the title and inflict a rare defeat on Nicol David, the seven time world champion. Game one –Long rally to start. 2 straight drive winners by Waters, a tin by Waters then a crosscourt winner by Weleily2-2. Mistakes by Waters and Weleily both know there are narrow margins in a match like this 3-3. A nice counter drop, straight drive winner and bad bounce and Weleily leads 6-4.Later an ambitious boost by Waters fails but she redeems herself with a lovely drop. 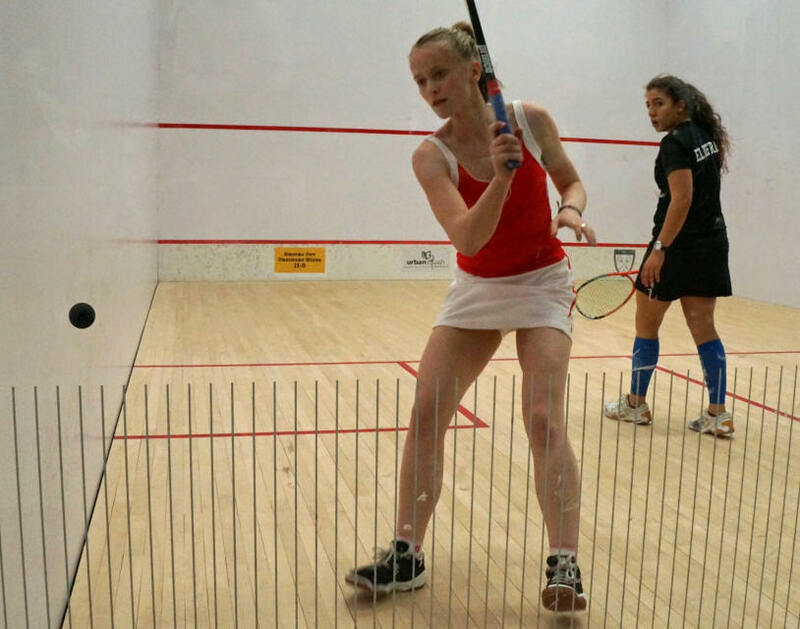 Game two-Weleily length wins her 2 of the first 4 points the other coming on a nice counter drop3-1.Another good length cross court from the front too much for Waters to handle she goes down 3-5. Waters concentrates on backhand rails, it pays off when misses a try for a high backhand crosscourt kill, and then a straight drive too much for her. Waters 6-5. Weleily ahead in next exchange Waters retrieving point to Weleily 6-6. Two strokes to Waters 8-7. Rare forehand drive to tin by Waters 8-8. Serve nick winner to Weleily. Nice slice crosscourt shot by Waters 9-9.Lob from front Waters couldn’t handle 10-9. An open court for Waters but she misses into the tin. Another game to Weleily. Game three- Weleily starts with a nick off a boost, crosscourt drop, good length for a backhand winner, and a Waters tin to lead 4-0. She is making no tactical or mistakes in execution…until she hits the tin. But goes right back at it with another drop. She’s hitting on all cylinders up 8-1. Game one-No surprise here. Perry is going to hit the ball hard. David is going to vary the pace and get everything back. The surprise after last year is Perry up 3-1.Perry much tighter on drops and moving better hits another drop to go up 5-3. David counters with 2 of her own to even at 5.A stroke, a tight deceptive drive, a drop, a short straight drive winner, a backhand drop and suddenly its game to David. Game two-Perry comes out firing. 3 Deep winners for her, David’s drop working. A great high backhand drop winner by Perry takes her to 5-2.Drop winner, Boost winner, tin and David even at 5. Nice drop from the back. Perry hits lovely backhand drop winner. Showing no ill effects from the night before 6-6.”oh that’s careless” from Perry as she doesn’t see a David drop. A deep winner, another good drop and David is up 10-6. A tin ends the game. Game three-a thunderous kill on the first point by Perry, applauded by David. An intense 3rd point, boost by David nicks the tin and then another tight drop by Perry 4-1.Perry gaining confidence. Great straight length drive from front eludes David and a stroke 6-1. David takes next 2 but Perry drops a high shot for a winner and a David tin8-3. Perry like a dog with a bone. Very nice next point. Another high forehand drop kill, then a David tin takes Perry to 10-4. Tin by David and Perry takes the game. Game 4-David between games sat alone regaining her focus. Goes up 2. Perry hit return of serve winner, amazing tight drop, forehand shot drive to go up 3-2. David answers with the best get off the backwall I’ve ever seen and later in the point a fine drop gives her 5-3 lead. Incredibly tight rallies. A stroke prompts an “oh John!” from Perry. Defensive lob goes out 7-4 David. They exchange points 8-5. Long rally ends with David straight length winner 9-5. After a long rally Perry hits tin 5-10. Perry hits a hard rolls corner winner 6-10, David hits deep cross court the hits the nick and takes the match. In Cleveland it was not only Superbowl Sunday, but the quarterfinals of the 2013 WSA Tub o’ Towels Cleveland Classic. After watching the first three points of this match, the crowd thought we would be in for a tight one. Both players hit a few amazing winners early. El Weleily then got going and starting hitting winners at will. She was moving Au to all four corners of the court, but Au could only retrieve for so long. After a close start, El Weleily took the game 11-3. In game two it was more of the same, but Au was starting to find her shots and move El Weleily a little bit. 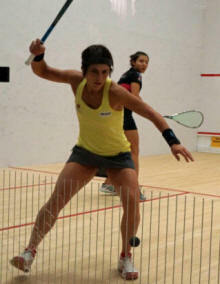 Unfortunately for Au, any loose shot was quickly put away by El Weleily. Game two went to El Weleily 11-6. In game three, Au came out aggressive in search of finding a way to win. 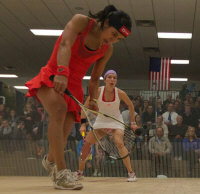 Au was able to surprise El Weleily with her tactics, but El Weleily was still able to close out the match 12-10. Game one- completely different tone from the 1st match. Long rallies. Every point well earned. David gradually pulled ahead 7-4. Wean came back 7-7.David responded winning 2 long points 9-7. An unexpected tin by David the n another long point that ended on a tin by Wean took David to 10-8. A tin by David when in control and a nice shot by Wean took them to 10 all. 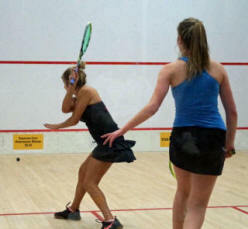 A great get by David off the back wall that died against the front give her game point. A series of drop/counterdrops won by David secured her the game. Game 2 – 2 tins when in front by David then 2 boost winners 2-2. David turned up the heat 6-3. Wean responded 5-6. But David was relentless and streaked out to 10-5 and closed out the game 11-6. Judging the match today from how each player played yesterday, you might assume El Sherbini would have had a good chance, as Waters looked flat and El Sherbini was playing great. 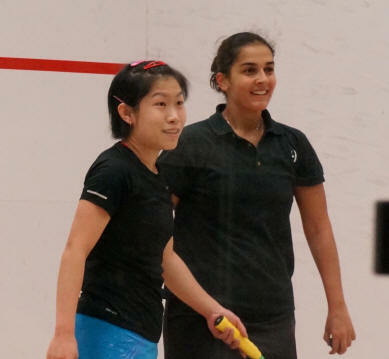 Waters came out determined not to let Sherbini control the T. Both players started out trying to establish their length game. They traded points throughout the game and Waters was able to stay on top winning 11-9. Game two saw Waters’ game plan really start to work. El Sherbini was being moved all over, as Waters stayed in front attacking, while El Sherbini just tried to keep the rally going. Waters cruised 11-2. El Sherbini came out in game three clearly frustrated with her play, but was able to start and string together a few points, which gave her some confidence. The match got interesting at 8-7 Waters, where there were three let points in a row. Waters’ was able to close out the match at 11-7. Game 1- Tremendous power from both players. King forges off to a 4-1 lead and extends it to 7-2 working well from the front. She cruised to carry the first game. Game 2-Fantastic 1st point. King gets everything and wins on a nick. Back and forth to 5all. Neither player giving an inch. A great display of power and athleticism. Perry moves ahead to 7-5 on a King tin. The rallies remain long and intense. King using her boost great effect, Perry countering with a straight drive winner. Finally a boost by King nips the tin and second game to Perry. Game 3 Much of the same. Great squash. Each player trying to gain an advantage. Even at 5. Pace is still brisk but more varied. 3 nice points by King give her a8-5 lead. 2 by Perry bring her to 7-8 but King responds with 3 nice points to win the game. Game 4-Perry is not one give in easily. 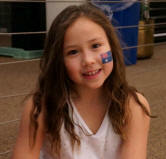 She came out determined and worked her way to 4-0. Quality of play still quite high as they exchange to 7-3. But Perry seems to have gotten stronger and found the winning strategy as she goes on a run to win the game. Game 5-A furious fist point rally with a let instead of a stroke called leads to a pheet! From King. Still she wins the replay and then moves out to a 4-1 lead…and broke a string. The next rally went on forever and was finally won by Perry. As was the next and the next. Perry on a roll to 5-4. King wins the next point and we are tied again. The next 2 to Perry and a tin by King takes us to 8-5. Two straight drive winners by Perry takes her to match point which she wins with another straight drive. There was an excellent line up in today’s matches at Tub o’ Towel’s Cleveland Classic. 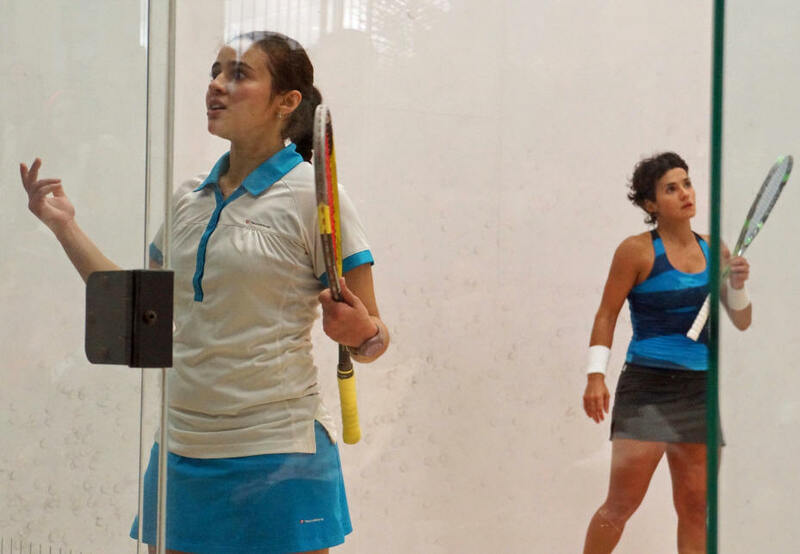 The quality of play was extremely high for a final round of qualifying, but that is to be expected as all of the ladies fighting for the final four spots in the draw of 16 are ranked in the top #35 in the world. Both players seemed a little nervous at the outset of the match. They both know how strong each one is at the front of the court, so the first part of the match was played mostly in the back corners. Grinham was able to start stronger and control the T throughout the match, but Arnold usually found a way to keep it close. Arnold was not ready to give in. Arnold took the third 11-9. 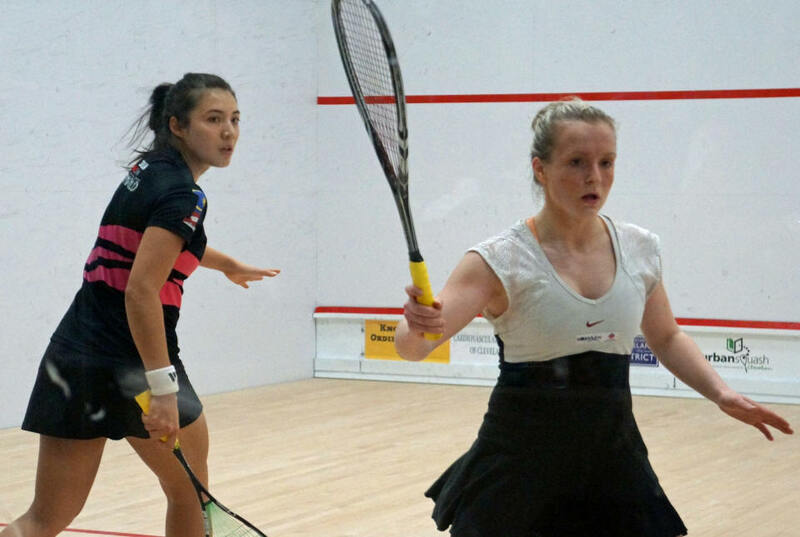 In the fourth, Grinham extended the points and did not give up her position on the T to win 11-2. This was an exciting match. Both came out strong playing, playing fast-paced, hard-hitting squash. Kippax was clearly in control during the match and using her deft touch in the front court to her advantage. Fernandes, playing well was just a little bit over matched. 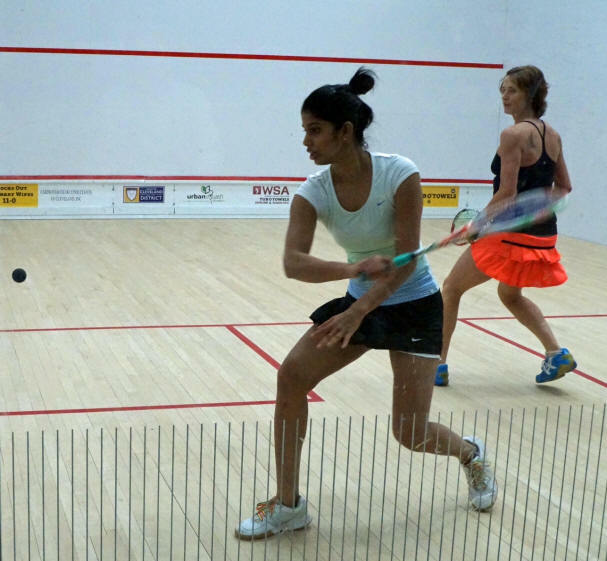 The match was highly entertaining throughout, but the biggest turning point was when Fernandes took at 9-4 lead in the second game. Kippax was able to refocus and rally winning the next 7 points for an 11-9 game victory. Unfortunately for Fernandes, and even with all of the points being very competitive, Kippax was able to coast to an 11-3 victory in the final game. Game one showed good pace and length by both players but Chinappa attacked more and made less errors to secure the game. Same pattern in game 2 early and Chinappa raced off to a 7-3 lead. 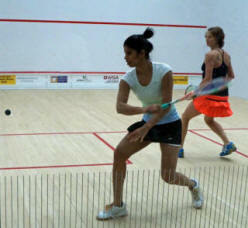 Khan stuck with her game, Chinappa made a few errors and it was 10-9. Chinappa hit a straight drop that clung to the wall and won the game. Game 3 saw Chinappa open up several leads but Khan kept fighting back. Down 7-9 she won 3 straight points to go up 10-9. Chinappa was able to tie at 10. Back and forth it went in overtime. 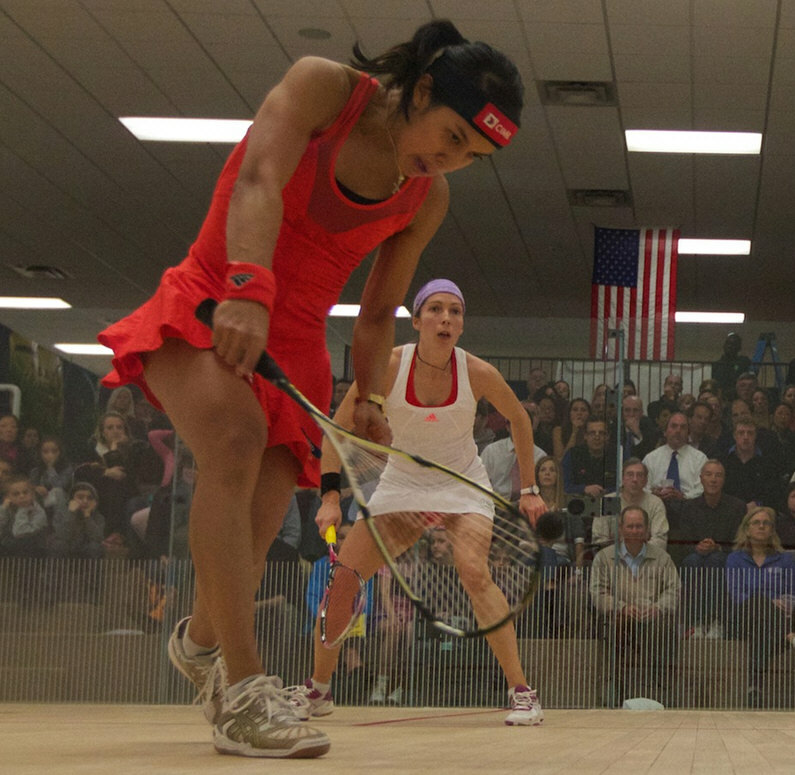 Khan fought off several match points until she was able to win the game. Game 4 was an err0r fest early and the rallies were shorter. They settled down and once again began exchanging points. Several contentious points took us to 10-10. A nice drop by Chinappa took her again to match point but a fantastic winner by Khan saved her. This was highly entertaining. Game one Kawy came out firing as is her wont. It was 5-2 quickly. Whitlock gave her father an interesting look. Just as quickly several errors made it 5-5. Back and forth until a tremendous overhead kill by Kawy wins it. han regained her form and moved again 9-7. Whitlock hit 2 lovely backhand drop winners and it was 9-9. They exchanged to 10 all. At game point Whitlock hit another backhand drop to win the game. Game 4 Several interesting early points as Whitlock win in the third game seemed to have given her confidence in her strategy. Many challenging points lead to 6 all. Suddenly however 3 quick kills by Kawy gave her a 9-6 lead. She closed it out with another powerful forehead winner. It was a great start to the 2013 WSA Tub o’ Towels Cleveland Classic at the Cleveland Racquet Club in Pepper Pike, OH. This is the 7th iteration of this event and all the proceeds go to benefit Urban Squash Cleveland, an after school youth enrichment program in Cleveland, OH. With an impending snow storm set to hit the Cleveland area this weekend, anything can happen. Even with questionable weather, the crowd came out in full force, as the gallery was packed as if it were the finals from the first match to the last (I am sure the $1 beer and pizza, might have played a small role). Arnold came out strong in the first game and took game one easily at 11-4. Sarah looked very nervous, but was able to come out strong in game two. The points were much longer with play going to all four corners of the court. Both were playing good conservative length. Points were traded nearly all game, with Arnold getting the first chance of a match ball at 10-8. Arnold was able to win the next three points to have game ball at 11-10, but could not convert, eventually losing 13-11. 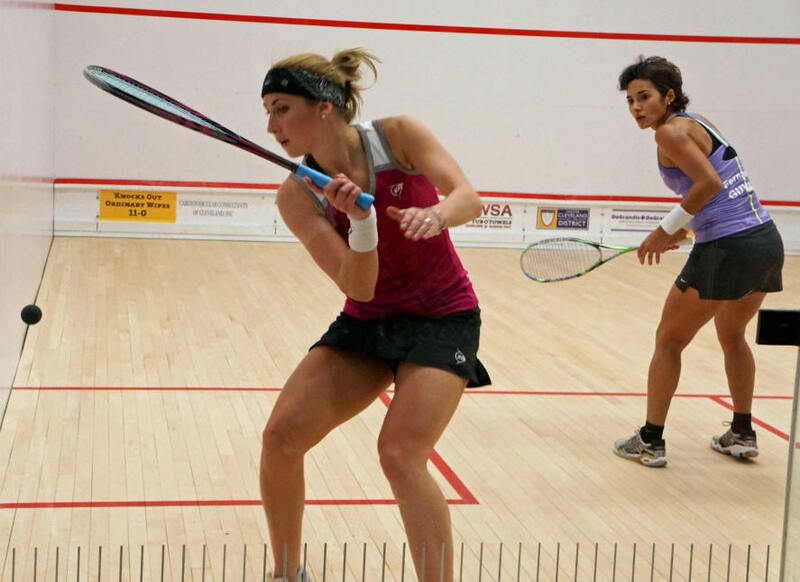 The steady and smooth play of Arnold proved too much for Cardwell, as Arnold was able to begin the third game with a 10-1 lead, ultimately taking the game and match at 11-4. 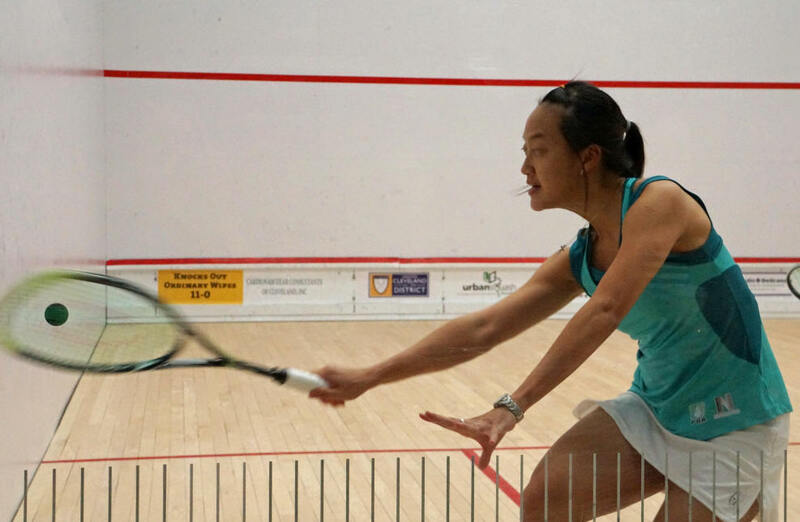 Watching Latasha construct a point is a primer on how to play squash. 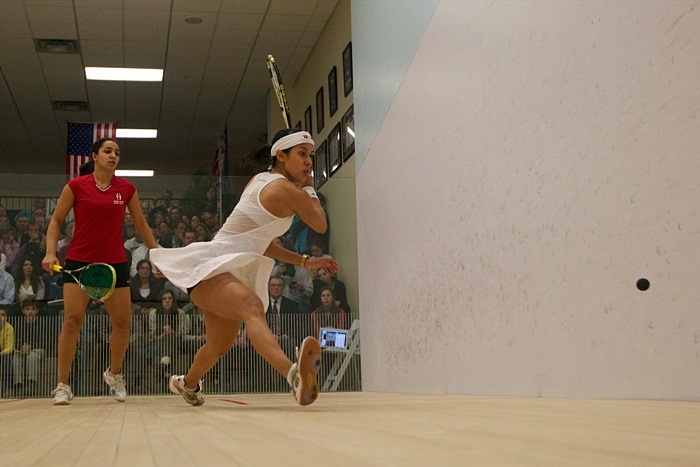 She has been playing some of her best squash the last several years and is fan favorite here in Cleveland. She made short work of Jacqueline in 3 straight games. 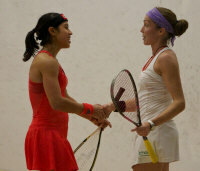 This match was a short and predictable, With Chinappa being ranked nearly 100 places higher, than her opponent, Amin. Chinappa came out smooth taking advantage of the myriad of short and loose shots of Amin. Amin played much better in the second game, ultimately leading 5-4, but Chinappa rallied to win the next 7 of 8 points to take the game 11-7. The third game was more of the same with Chinappa coasting to an 11-6 win. This match would prove to be the most intense match of the evening with Fernandes ranked #32 in the world and El Torky at #34 in the world. In the first game El Torky came out firing in the traditional Egyptian way, taking the ball short early and often winning 11-6. Fernandes was able to gather herself in game two by playing the ball much tighter to the side wall, winning 11-7. Then the match got really intense, both players were wearing their emotions on their sleeves, Fernandes, psyching herself up and El Torky was letting the referee’s decisions and her own play get the best of her. Game three was close, but El Torky found a way to build a lead, and it was clearly frustrating Fernandes. 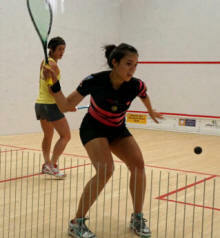 A poor shot from Fernandes closed out the third game in El Torky’s favor, 9-11. 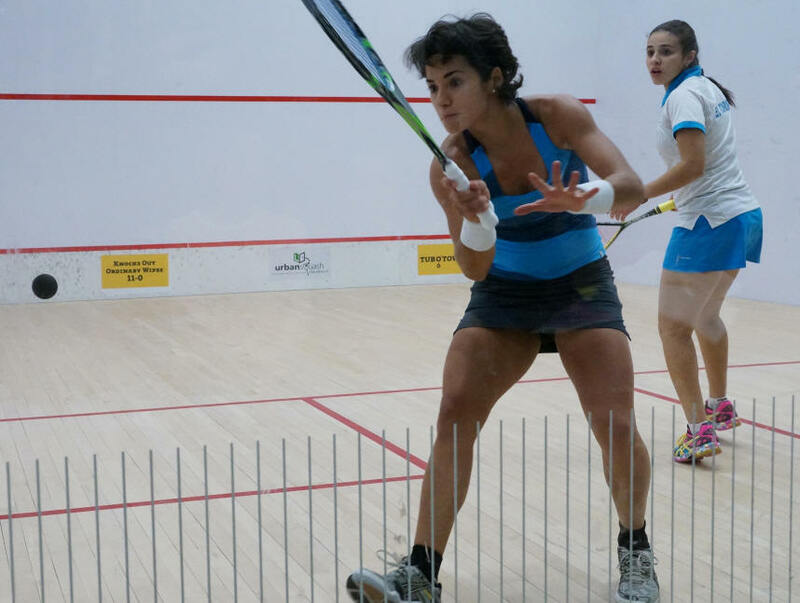 Fernandes was able to rally and take a few more risks in game four, while El Torky clearly showed her youth by letting the referee’s decisions affect her play. 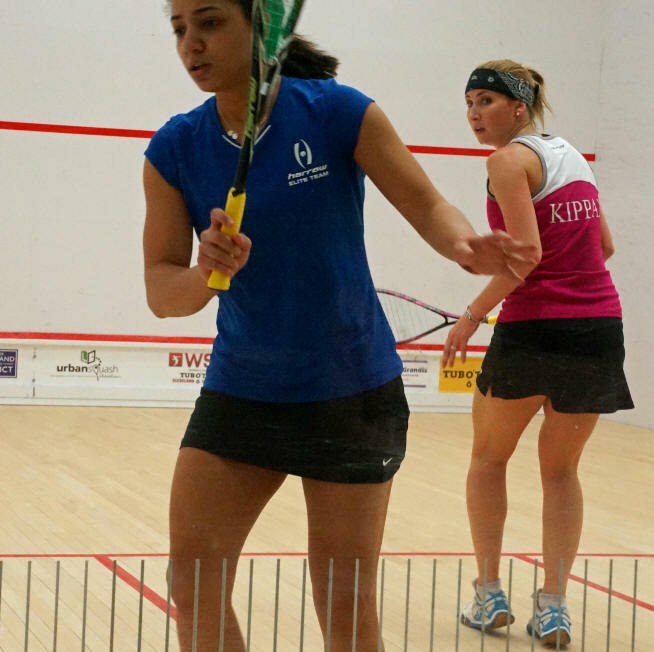 Fernandes was able to comfortably control all of the points in games four and five, winning 11-6, 11-4, respectively. In the first game Pakay showed a lot of flair, but Kippax is very athletic, stayed in points that others might not of and kept with her game. The second game was over quickly. The third game was also highly entertaining. Kippax used her experience to control the game and cruise to the win. A nice matchup of two young players. El-Defrawy came out firing in the first 2 games and held off Whitlock in both. Especially in the 2nd game El-Defrawy held off Whitlock winning critical points with spectacular shots, often followed by Whitlock errors.